Me and my teammate are coming here in Oslo at 28th of October 2018. We are a Christian from IFES local Madagascar, and we have internship here during 6 months with Laget. We live in Mortensrud. Brit Hodne is our contact person and she help us to adapt for every thing. Oslo is a big city. It's the capital of Norway and a beautiful city. Many people here are immigrants. Many attractions and activities are happening in the same time. You just choose. The transport, the population, the business are interesting. The life in general here in Oslo is busy, maybe because Oslo is the capital. You can see the politic, the religion and the culture in the daily life. The technology is very high, you can use it wherever you are. Wao, we are here like a dream! At the first time, it's very confusing to take and find the T-bane. There are many means of transport but we choose to go with T-bane. Our contact person help us but we should learn to go alone. The east or the west! That the confusing thing! It looks like the same, when you came or when you went. But we found it finally. So, now we are not lost with T-bane. We have never used the card, but now we use it. There are many different types of card, Bank card, bus card, student card … and we must bring it, because if not, it probably became a problem. That's interesting, it makes a life easy. Oslo! In general people here in Norway likes a guest. They like inviting people and have fun for that. But not in the transport, they need space and don't want to talk anymore. They are so cold for the relation with unknown, but they are closer with friends and family. When we came here, Brit invited us to have a party in her home with some friends. We are very welcome! We are so happy! Now, we start to work with Laget and join all activities there. All of our activities takes part in evangelism, to make Jesus known in schools and universities, so that he is believed, loved and followed. We have different programs for that, to have a fellowship and to get the opportunity to share faith for the student. We start also to use social media to share our experiences and Laget work. Every Monday, we have a staff meeting at the Laget office. Wao! We are like a staff, yes we are. That change the mind and change also the attitude. Now, we use English language at the staff meeting, because we don't know yet Norwegian language. We share about our last week and tell about the next week. It helps us to review and evaluate the task we have to do. The important thing is to be understood in all of situation or circumstance in each staff, and the organization. After that, the staff fellowship with devotion and prayer are amazing. We like it so much! Because we belong to Jesus! Every Tuesday, we have Lagslunsj at the university in OsloMet, just thirty minutes during the lunch for a small bible study. We have English group and Norwegian group. Even, we are not so many, we enjoy it because Jesus loves the students, and want them to be saved and to be a good leader in the future. So, we have that call in our heart, we are not discouraged. We continue to pray and to share our faith. We also have Norskkurs in Frikirke here in Mortensrud Tuesday evening, we go there every Sunday for the service. Many immigrant go there to study Norwegian. They are very good at teaching. This Church is like a missionary Church. They are so kind and open for all people. Now, we start to understand Norwegian, but it's so hard to speak because it's very difficult! But we like it. We have also laget lunch in french here in Mortensrud. This is for the Church, to help some of the people who can't speak another language except French. But we can speak French so that important to participate and to have a good fellowship there. We have just 3 members with us, sometimes one, but it's ok. We pray for them and encourage them in their faith, so Jesus show His mercifulness that He never changes and will be with us always. Because we are Laget Interact, so our work also is visiting a new Church to find youth and to represent Laget as a organization and movement for the young students. We help the Church and help the young immigrants to not lose their faith in Jesus. Sometimes, we visit the new Church Sunday afternoon. It's very important to know more about Laget missions. Now, I would like to share our daily life, and our hobbies. We live with our host family, the General Secretary of Laget, but they are upstairs and we are downstairs. We have our own life but we try to have a dinner together every Wednesday. They are so cool! So, we cook Malagasy food when we have a time every day, and in the week-end. We miss Malagasy food! We try to adapt in the weather, just we use warm clothes. We have a challenge for the dark, so we prefer to stay home and do our school things. We divided our tasks, and we help each other for that. We try to invite our friend one day... and it was very fun. We will do it again. When we are tired, we just relax, listening music or watching movie or reading. Me and my teammate are little different, so we do also something different in the same time. We enjoy Oslo and the life here. We can go to swim every Wednesday afternoon, and we participate in KRIK sport every Friday. So, I think that is enough for the hobbies, and also to include many different youth. Laget focus in evangelical in school, so they work with the student. I am so happy and thankfull for the opportunity that we have in working with Laget because we can share our faith at the university and grow in that faith also by doing the bible study. We have staff meeting every Monday. During the meeting there is devotion, prayers and everyone participates for the sharing of their work last week and for what will be the specific program for week after. It was so great to do that because we get to know much better each one of us and its help us to know how Laget do. The word of God is the first on which Laget focuses most. So they have ``Laget-Lunch`` wich is a bible study that we do at the university during the lunch time, gathering people like preaching Jesus and get fun through game or talking also. "For the word of God is living and effective," it says in Hebrews 4:12. Therefore, Laget spend time studying the Bible. We have also Christian Union, it is a part of laget. Christian Union is a fellowship between youth student, and we do the meeting in Blindern, they have praying together and sharing, bible study, devotion, worship, video debate…we are actually international and national student, so the meeting is in English. we are supposed leader in Christian Union so we participate in leading sometimes the programme, it may be bible study or seminar or devotion or worship and prayers. 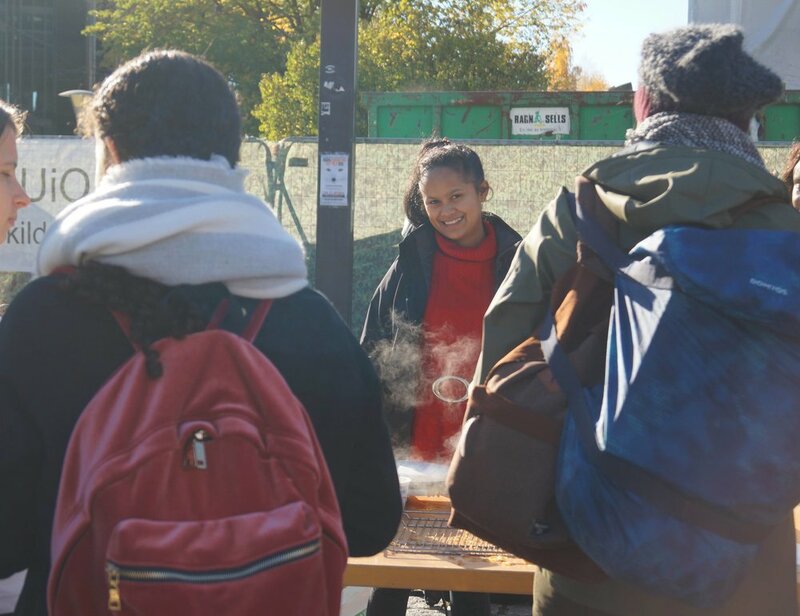 Sometimes we cook and prepare malagasy food for the people coming in Christian Union. We can discover more about Norway here with Christian Union, living the culture, because we went in cabane trip. And it was very great, we can know better each others and we had quite time and devotion there. i see that to be with christian youth is very good, happiness, and marvelous. We can adapt the cold now here in oslo. we spend a lot of time in the street when we see snow and play with it. it`s like we become child, we enjoy playing in it. How can God be good when he lets anyone end up in hell? why should you believe if you do not feel that you need it? What is really the meaning of life? If God exists, why does he not become more visible to us? Is not it arrogant that you are right and others are wrong? The important of the work in Laget in general is to make Jesus known in every school such us high school or universities. Sharing the gospel and bring people to Jesus. Be light into the darkness. For God alone is the glory for the opportunity in working for God with Laget.